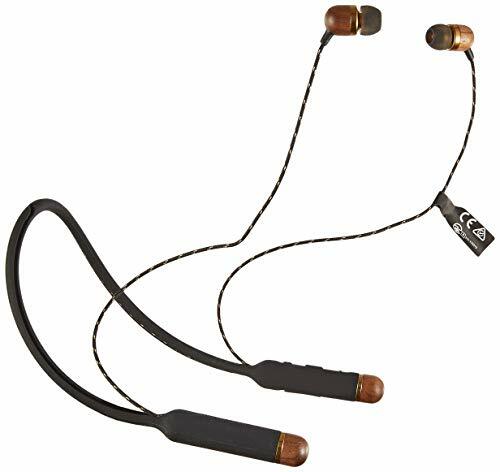 Lock in your House of Marley Smile Jamaica Wireless Bluetooth Neckband Headphones with BudLoks™ - Far End Gear™ Products for outdoor enthusiasts - earbuds, earphones, and earbud sport grips. First in class and comfort, Smile Jamaica Wireless combines FSC Certified Wood and recyclable aluminum housings to create an iconic Marley in-ear headphone that is available in a bounty of colors. The noise-isolating design and 9mm dynamic driver deliver rich and full sound that brings you straight to the source. Go ahead, smile for me, Jamaica. SUPERIOR SOUND: Enjoy a truly impressive high performance sound quality. The earbuds are acoustically perfected and balanced with 9mm dynamic drivers that offer maximum bass. The noise-isolating design will help prevent distractions at the gym. STATE-OF-THE-ART FEATURES: The Smile Jamaica wireless earphones have a 3-button remote on the wire that allows you to play, pause, and skip through your music. Wear the earbuds confidently as they are solid, durable and sweat resistant. ECO-FRIENDLY DESIGN: The in-ear headphones offer solid construction with FSC Certified wood & recyclable aluminum housings. The ear gels are Regrind silicone that offer lasting comfort as the silicone gently conforms to the shape of your ear. RECHARGEABLE & COMPATIBLE: These wireless headphones have a rechargeable battery that can last up to 8 hours of playtime from a single charge. They include Bluetooth wireless connectivity that uses 4.2 BT. HOUSE OF MARLEY: House of Marley is built on the principles of superior quality, sustainability and a commitment to charitable causes while enhancing lives through great product experiences, as well as using proceeds to support global reforestry.